Looking for a rewarding lifestyle by the sea? If you’re passionate about paddlesports, have a genuine heart for people, thrive in a team environment, and love the sea, you’re looking in the right direction. Sea Kayak Baja Mexico is a very tight, supportive team. We work hard until the job is done, and we laugh a lot in the process! We’re looking for people with the same level of dedication to the team and to the larger community. 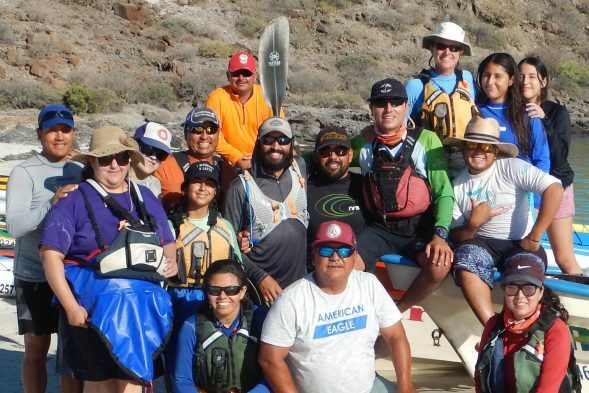 If you’re Mexican, are fluent in English, and live in Loreto year round, or want to, and have an interest in paddlesports, we have opportunities to train up with us. If you’re not Mexican, but have expedition experience, excellent communication skills in English and intermediate in Spanish, can live in Loreto October through May (or longer), we have a position open this season, that could open doors for long term, especially if you are available to answer emails year round. There is also a part time Repair Specialist opening. Wages are relatively high for Mexican standards, modest for US standards, and fair within the team no matter where you come from. Perks are many! If you’re interested, please introduce yourself, ask for a detailed job description and send CV/resume to info@seakayakbajamexico dot com.